In June 2016, the British public voted to do the unthinkable: leave the European Union. For a while there was some uncertainty. After all, this was unprecedented, so it was anyone’s guess which way things would go. Almost a year later, the situation is starting to get a little clearer. After an eight-year recovery built on rising asset prices and debt but stagnant wages, the poor and the old will see their incomes and savings dwindle. The canary in the coal mine is the pound sterling, which already dropped from over 1.50 to 1.25 against the US dollar. For an island that imports half its goods and food, this means higher inflation. High street retailers are already feeling the pinch: expect even smaller portions and less fruit and vegetables on the shelves. Brexit uncertainty could also scare off some investment and push jobs away. In fact, some firms are already relocating elsewhere. This means Britain’s ultimate store of wealth and property could turn into a trap. With a fall in investment and demand from foreigners and interest rates already at rock bottom, London’s market has already cooled off. There is little the government will be able to do this time around: schemes like Help-to-Buy, which helps people become home-owners, will have to give in to the reality of a 5% budget deficit and the need for lower spending. Higher taxes may be on the way too. While the last budget from Number 10 ignored Brexit, some local councils are already feeling the pinch and threatening to raise taxes. But for a country deeply divided by economic and social rifts, leaving Europe was never about the economy. It was about finding unity. Polarizing public opinion against the EU and immigration and away from domestic issues was an easy political win. Yet Brexit will not fix the shortfalls of the Anglo-American growth engine, which ran on credit and rising asset prices over the past few decades, disregarding rising inequality, a lack of inclusive access to education and declining social mobility. Britain’s richest and privately educated citizens account for 7% of the population yet makes up two-thirds of judges and around half of journalists and members of parliament, according to a government report. Meanwhile, the Child Poverty Action Group estimates that 3.9 million children live in poverty. The UK ranks second in the developed world for inequality, after the US. Brexit will not change that, nor will it make Britain more united: the English patient was sick long before the divorce from Europe. With an economy focused on finance and services, and highly dependent on foreign investment, the idea of creating a “truly global Britain” isolated from its closest trading partner is economic la-la land. The reality instead will be a hard Brexit: Britain’s bargaining position is weak. Europe’s incentive is to give the UK a bad deal to set an example for other countries, yet not too bad to backfire. Britain’s incentive is to take it. Brexit Secretary David Davis recently admitted to not knowing the cost of a no-deal. His thinly-veiled threats to walk away from negotiations bear little credibility: Britain depends on the EU for half of its exports, while Britain accounts for only one-sixth of Europe’s. For Britain, this means any deal would be better than none at all. The irony is that by running away from a European Union they thought was about to fall apart, Brexiteers have instead made it stronger. Voters in France and the Netherlands are rejecting populism, and politicians in Brussels and Berlin have switched gears towards reforms and pro-EU spending measures. Theresa May, self-appointed leader in this historic negotiation, has so far revealed little about her strategy. We do not know whether beyond this secrecy lies a feasible plan. But one thing is sure: the prime minister has already weakened Britain's negotiating position. First, she wrong-footed the start by threatening to walk away and to make the UK a Singapore-style tax haven. Second, she has made unrealizable promises. Keeping substantial access to the single market and having strict immigration controls are mutually exclusive for the EU: achieving both is highly unrealistic. Third, the prime minister has not been honest about the true cost of Brexit. May said repeatedly that Britain could walk away without a deal and be fine. Instead, a painless exit without a cliff-like effect on trade is only possible with a transitional arrangement. To obtain that, the UK will likely have to pay the €60 billion it owes from its past years of membership, as well as a membership fee for access to the single market. Brexiteers have bought into the illusion of shaping a fairer and more independent country. Soon they will realize that the politicians’ promises are just empty words. They will have no one to blame but themselves. From a game theory perspective, we think the Brexit negotiations are likely to lead to a bad deal for the UK, which it will eventually have to accept. On the one hand, the EU has an incentive to offer a bad deal to the UK, so as to set a tough precedent for other countries: the political costs of appearing too lenient will outweigh the benefits of maintaining benign trade relations with the UK. On the other hand, the UK is economically more dependent on the EU; 44% of its exports go there and 48% of its foreign investment comes from them. This is not to mention the potential damage from a loss of passporting rights to the services sector, which makes up for around 79% of UK GDP. Hence we think the UK may try to act tough at the start of negotiations, but eventually will have to compromise to avoid bigger economic fall-outs. 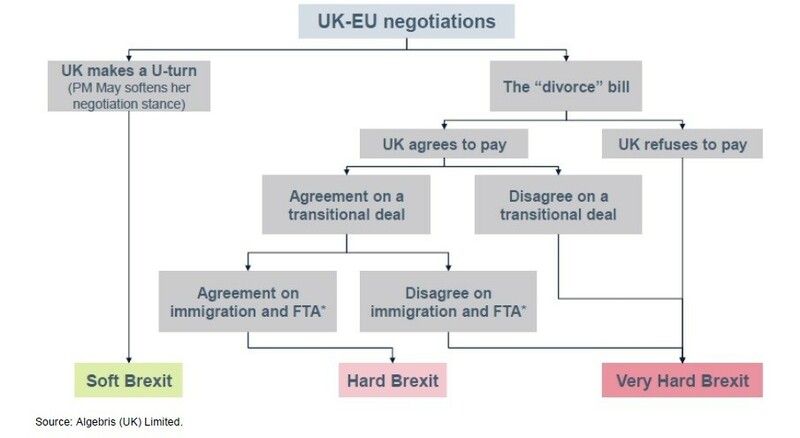 As we illustrate below, the equilibrium scenario based on both sides’ incentive structures will be the EU offering a bad deal which the UK will accept. The first negotiating point will be to settle the divorce bill which the UK owes for its past years of membership. Beyond that, the key will be for Britain to secure a transitional agreement and avoid a cliff effect on trade. However, to reach a deal and to have access to the single market, the UK may have to compromise on immigration and potentially pay a fee. Both would require May to take a softer stance, something that is currently politically difficult given the split within the Conservative Party. 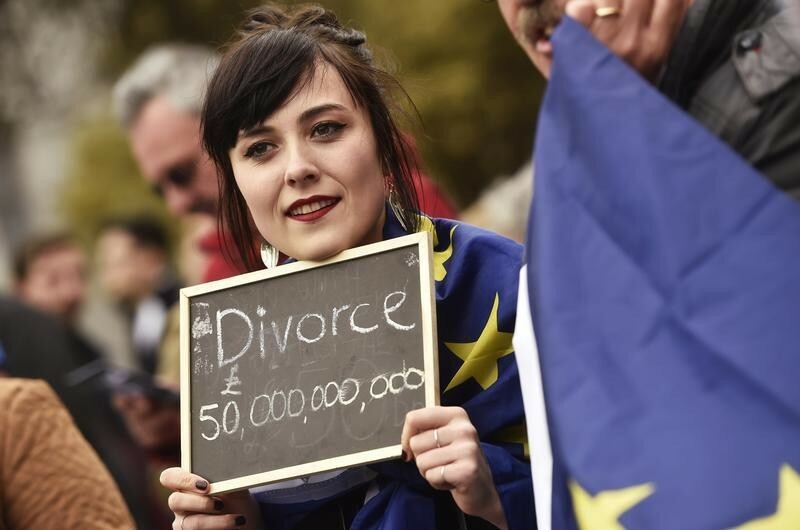 The “divorce bill”: European Commission President Jean-Claude Juncker and the EU’s chief negotiator for Brexit Michel Barnier have said that the UK has to pay an exit bill of around €60 billion, and the bill would need to be agreed before beginning negotiations on an FTA or transitional agreement. The UK’s Brexit secretary David Davis so far ruled out paying for a hefty bill, as it would be politically challenging given that Brexiteers campaigned on a promise of “saving £350 million a week from Brussels”. Ultimately, we think the UK and EU will agree to a bill, but that this will only be paid after a trade deal is finalized. This would allow negotiations to continue, while not appearing as a defeat for May. In our view, the complexity behind the Brexit bill calculation means there is room for the UK to negotiate when it comes to the EU’s current estimate of €60 billion. The exit bill itself mainly comes from the UK’s budget commitments for 2019-2023, which it still needs to pay post-Brexit, unfunded pension liabilities for UK staff who worked in the EU’s institutions, and other contingent liabilities. According to estimates by the Centre for European Reform, the bill could range between €24.5 billion and €73 billion, depending on the calculation methods and what will be covered. Free trade agreement: May aims to achieve a “bold and ambitious free trade agreement” with the EU and start negotiations early, as expressed in her letter to President of the European Council Donald Tusk. May has downplayed the challenge of achieving an agreement by stressing that sectors like the auto industry and financial services may adopt existing single market agreements. However the reality will likely be an extended period of uncertainty, as both sides may agree the broad terms of a trade deal before 2019, but leave the details and ratification for a later date. Additionally, as part of the broad terms agreed to, the EU and UK will need to agree on an institution to settle FTA disputes so as to give the EU assurances that following a trade agreement, the UK will not undermine the single market through regulatory dumping. Immigration: The Brexit campaign focused on the cost of net migration and promised voters fewer migrants if Britain left the EU. May will now need to deliver on this promise, as she highlighted in her January speech. While May has effectively ruled out the possibility of implementing a point-based migration system for EU nationals, the final deal may include a limit on net migration from the EU under a work permit scheme. Transitional agreement: UK-EU trade will need to be governed by a transitional agreement, between the date that the broad terms of an FTA is agreed and when the FTA comes into effect. Rather than negotiating separate terms for this transitional agreement, we think during this period UK-EU trade will remain governed under EU law and the European Court of Justice. Could the UK make a u-turn? A turnaround on the Brexit decision is very unlikely and would result in a split in the government and the Conservative Party. However, the rational strategy to avoid a bad deal or no deal would be a more friendly negotiation aimed at agreeing on a transitional agreement and avoiding a cliff-like effect on trade. Doing this, however, requires political capital. The prime minister's approach so far has been a tough one, partly to appease the hard-liners in the party. Negotiating a soft Brexit while appearing to be hard on the EU is a difficult strategy, and in our view it would take time and more signs of economic weakness before the UK is able to soften its approach. A weaker sterling, with higher inflation: We think the pound sterling will likely weaken further as the illusion of a good deal fades. The Bank of England is unlikely to offer much help, both because it does not have the foreign-reserve fire power to defend its currency, and as the Bank will likely maintain an accommodative monetary stance to support growth in the face of rising inflation. A potential loss of reserve currency status would further hurt sterling, which currently makes up 4.5% of global FX reserves. With the UK importing nearly 46% of its energy and 50% of its food, a weaker sterling will lead to higher import-led inflation. A growing public deficit: Chancellor of the Exchequer Philip Hammond’s spring budget effectively ignored the consequences of Brexit, predicting a decline both in borrowing and debt-to-GDP by 2021. The budget is predicated on unrealistic expectations of declining unemployment, falling inflation and steady growth. The reality is that the government may need to increase fiscal spending to support the economy, leading to a further widening of the fiscal deficit, currently at -3.8% of GDP. Lower consumer spending will hurt retailers: The Office for Budget Responsibility forecasts that UK household debt-to-disposable-income will rise from 143% in 2016 to 153% in 2022. This will likely result in households having lower disposable income, at a time of higher inflation. UK retailers are likely to be squeezed by lower revenues and higher costs due to import-led inflation. Negative real returns for savers: With the Bank of England likely to maintain low rates despite rising inflation, Britons will suffer from negative real returns on their savings, which are already precariously low. According to a study by Money Advise Service, over 16 million Britons have less than £100 in savings. The property market is unlikely to provide sufficient protection, with markets already showing cooling signs given lower demand from foreign investors. Brexit is a symptom of Britain’s deeply rooted economic imbalances: a growth model too concentrated on finance and services and dependent on foreign goods, human and financial capital; record-high social and wealth inequality; a lack of investment in infrastructure and education; and monetary and fiscal policies that have helped create a property bubble and excess household debt. In their attempt to create a fairer and more equal country, Britons sought to sever ties from what they saw as a weakened partner. The reality is that Brexit will likely make Britain weaker and, ironically, is making the EU stronger.